Explore! Study! Research! Pray! Ask Questions! 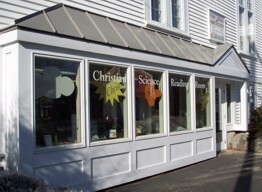 The Christian Science Reading Room is a library and bookstore located on the street level of our church where the Bible Lesson is available to study on the specified topic of the week. research, or sit in our comfy chairs to read in front of our fireplace. newspaper, The Christian Science Monitor, are available to read and/or purchase. A computer is also available to do research and connect to spiritually related sites for youth as well as those for people of all ages. Click on the tab, "Links" to find out more. See the Welcome page for current Reading Room hours.